The "Holly Blue" (Celastrina argiolus) which is my first time seeing this butterfly listed with this common name. I have always seen them listed as "Spring Azures".......interesting. The genus Celastrina (Lycaenidae) is a mystery to me simply because they all look alike. There has been "speculation" (Idk whether this was a joke or not) on whether or not the entire Celastrina genus was one big mega species. I mean Celastrina argiolus has fourteen different subspecies alone (See Wikipedia) as well as 6 different seasonal forms according to The Butterflies of North Amerca: A Natural History and Field Guide (James A. Scott). ← Look! I'm promoting! Go buy it now! But does this answer the question alone? Is Celastrina one big mega species or not? This is something that appears to already have an answer from what I'm understanding. For instance upon further research before typing up this entry I have realized that I could be seeing three different "species" of Celastrina!! The reason I wrote 'species' as "species" is because C. ladon is/or was once considered to be a subspecies of C. argiolus. (See Wikipedia and do extra research) C. ladon doesn't occur over here......no matter what it is (species subspecies) they're found elsewhere. Confused yet? >:) Basically it's this: Celastrina in general is being questioned as it being one big insanely variable species. All my books are speaking of them as if the "mystery" has already been solved and I'm just questioning what's already known to "everyone else". The Azures are found throughout the Northern Hemisphere and are all very similar. In North America this maybe our most poorly understood group. Before 1972 where it was shown that Celastrina nigra was a separate species we thought there was only one azure. Now we know that there are at least three, and very probably there are at least several other sibling host-plant specialists. Our most commonest species Celastrina argiolus is quite variable geographically and seasonally. The caterpillars are tended by ants and the winter is spent in the chrysalis. "Dr. David Wright (22 Jan '06) believes this could be a Holly Azure. First described in 1999 it is known from Aiken Co., SC. 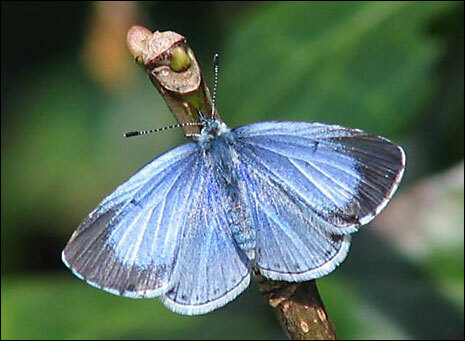 A Spring-flying species that resembles the Summer Azure. Summer Azures do have a Spring emergence in some localities - hence the confusion. Summer Azures are predominantly found in association with Black Cherry (Prunus serotina). Holly Azures are associated with Holly (Ilex spp.). Summer Azures perch with wings vertical above body; Holly Azures perch with wings partly spread at 30-45 degrees. This specimen has its wings partly spread. Identification may come down to habitat: are there Holly species in the immediate area? I am placing it as a Holly Azure so that photographers can be made aware of this species and hopefully get some more images in 2006."